Astronauts have a view of Earth like no one else. And since the birth of the space program, they have taken photographs of the planet to share with the world. As reported in the April 23 Eos, astronaut photography of Earth has now achieved a new level of spatial resolution. An analysis of more than 13,000 images shows that Earth photographs from the International Space Station have a spatial resolution of less than 6 meters, enabling scientists to use the photographs to study changes that are occurring in small features on Earths surface. While satellites have provided a wealth of imagery, photographs by human observers continue to supply low-cost, scientifically valuable images to researchers (Geotimes, November 1998). This past March, International Space Station astronauts aboard mission STS-109 took this image of the Galápagos Islands. 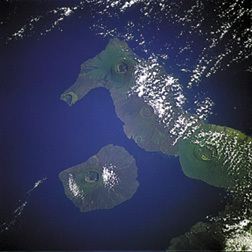 The seahorse-shaped Isabella and more rounded Fernandina are volcanic islands generated by a mantle hotspot offshore from Ecuador. Julie Robinson, a Lockheed Martin scientist for NASAs Earth Sciences and Image Analysis, and colleagues reported that crewmembers can produce higher resolution photographs by pointing cameras through a special window in the space stations Destiny Laboratory and learning to compensate for the relative motion of Earth. The first three resident space station crews took these images of Earth with digital still cameras, 35-millimeter cameras, 70-millimeter cameras and a variety of lenses. NASA has a searchable database containing more than 30 years of astronaut photography at. Water vapor is the most abundant greenhouse gas on Earth, significantly contributing to global climate. Since the beginning of greenhouse gas climate modeling, global climate models have shown that when atmospheric and surface temperatures increase, so too does the atmospheres ability to hold more water vapor. This additional water vapor absorbs heat, instead of allowing the energy to escape into space. Earths surface then warms  once again increasing the amount of water vapor and warming the planet. Climate modelers estimate that this never-ending feedback doubles how sensitive surface temperature is to an increase in human-produced greenhouse gases. But some climatologists think the climate system is less sensitive to greenhouse gases than the models suggest  creating an area of contention in climate science. Understanding the water vapor feedback is crucial to correctly modeling future changes in Earths climate. In the past, climate scientists have looked at heating variations for specific regions in order to study the role of water vapor in climate change. But reporting in the April 26 Science, Brian Soden of Princeton University and colleagues take a more global approach. They observed how the 1991 eruption of Mount Pinatubo in the Philippines created a global cooling pattern. Co-author Alan Robock of Rutgers University says Pinatubo provided a natural climate experiment to test model predictions of how water vapor behaves in the atmosphere. Sodens team observed a decrease in water vapor as the upper atmosphere cooled after Pinatubos eruption. Their model simulated the temperature change correctly for the water vapor feedback. This means, Robock says, that the sensitivity of global climate models to greenhouse warming has also been correct. A volcanic eruption has more in common with the type of climate perturbation well get from an increase in greenhouse gases than other previous phenomena looked at. This is a good piece of work that is drawing on a current climate perturbation that we can observe, says Tony Del Genio, a physical scientist at NASA Goddard Institute for Space Studies.